I needed—not one, not two, not three—but four clocks to put up in our workplace. Two weeks ago I got myself three of these Cambridge wall clocks, and so far, they’ve been working very well in the various offices I had them installed in. Very straightforward and business like, the black frame makes a very good contrast with the white face and black numbers—makes the time very easy to read. They have a professional look about them, too, which is one of the reasons I bought them. My co-workers appreciate that these don’t make disturbingly loud ticking noises, as this was why we had to replace the first batch of wall clocks we had. The Cambridge units are all functioning very well, and so far we don’t have any problems with keeping time; all hands are working accurately, and there have been no cases with any inadvertent delays or advances. 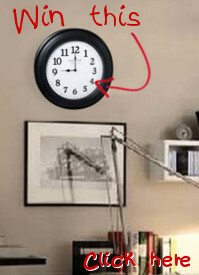 For the really good price, this wall clock is worth the buy. I have always loved grandfather clocks but I just find them too large for my living room and too expensive for a time piece. This is why when I saw the Seiko clock I didn’t waste any time to purchase one for myself. It is very impressive with its realistic chimes, a pendulum, ornate numbers, rich wood casing, gold casing and beautiful appearance. I got what I always wanted, and for a lesser price at that!